Samsung have certainly come a long way in a short time in the digital camera market. 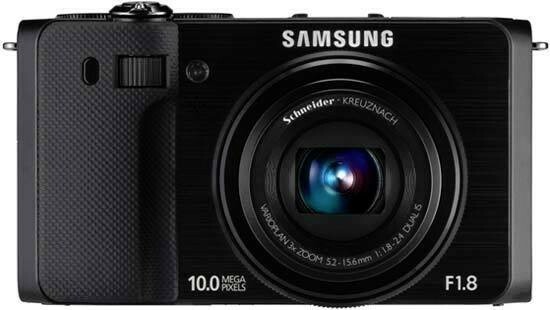 We can still remember the cheap multi-coloured look-alikes that the Korean giant used to churn out by their thousands, but recent cameras like the NX10 and now the new EX1 are a clear indication that Samsung has got serious. The EX1 is a serious photographic tool that concentrates on delivering high quality images with the minimum of fuss, yet can still be carried in your pocket. The lack of any HD video mode or burst RAW shooting are annoying, but the refined handling, bullet-proof build quality and great photos more than make up for the EX1's few real deficiencies. Having reviewed literally hundreds of cameras over the years, it's still very rare to pick a new one up for the first time and instantly think that most things feel just right. That's certainly the case with the EX1, thanks to its wealth of external controls that put all the major photographic functions literally at your finger-tips. The dual control dials on top, front dial for changing the shutter speed, rear wheel for the aperture and buttons for setting the ISO, metering and other key options mean that you'll rarely have to dip into the intuitive menu system. Only the sluggish RAW speed and slightly bulky size (at least in comparison with the EX1's closest rival, the Panasonic LX3) detract from what is otherwise a fantastically well thought-out camera. Image quality too is excellent, thanks to the larger than usual CCD sensor and the sharp and bright 24-72mm lens. While some people will find the 3x zoom limiting, it does help ensure that the picture quality remains at a high level throughout the focal range, with little distortion, chromatic aberrations or even noise until you use ISO 800 or faster - an excellent performance from what is still a compact camera.